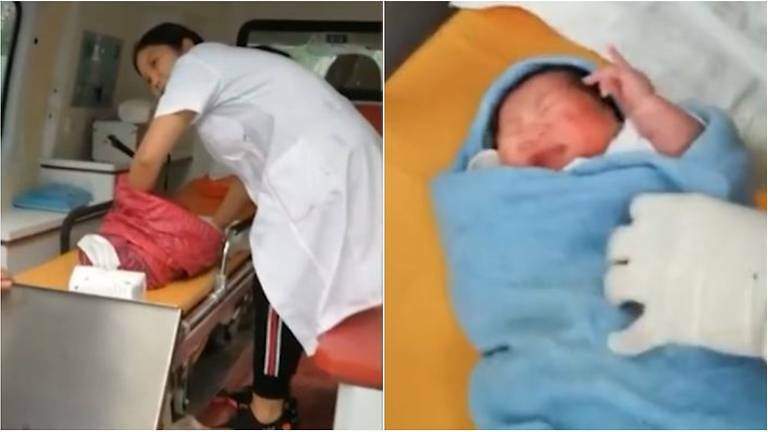 Screenshots from a video, which has gone viral in China, shows a doctor taking the abandoned baby out of a nylon sack after she was rescued. A baby girl who was thrown off a cliff by her father miraculously survived and was rescued 12 hours later, Chinese reports said on Wednesday (Oct 31). The girl went missing from Magui Hospital in Gaozhou, Guangdong province last Friday morning, Sina.com reported. After initial investigations, the police found the father's actions suspicious and he eventually admitted to taking the newborn and throwing her into the hills at 1am that day. The father, surnamed Li, led policemen and healthcare workers to a nearby cliff where they began a search at about 11am. He said he had placed the baby in a nylon sack before throwing her off the cliff. The slope was so steep rescuers had to use ropes to belay themselves into the wooded area to conduct the search safely, the report said. The baby's cries finally led one of the rescuers to her at about 1pm, 12 hours after she was abandoned. Rescuers told local media that her fall was broken by tree branches, and the porous nylon sack gave her some protection from the elements. Li said that his family was poor. After having two daughters and a son, he had been hoping for another boy. He has been detained by the police. A video of a doctor taking the baby out of the sack has gone viral in China.